Spear is called the king of weapons, so people study the usages of spear and try to defeat it by another weapon. Shaozi staff is one of the weapons, it has both the flexibility of a spear and the power of a staff with its tip full of changes. 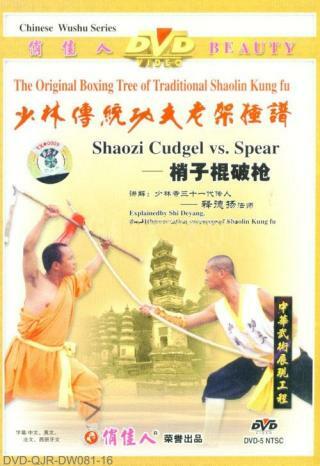 It is therefore a close match for Shaozi staff to combat against spear. • Qiang is the Chinese term for spear. Due to its relative ease of manufacture, the spear in many variations was one of the most ubiquitous weapons of the pre-modern Chinese battlefield. It is known as one of the four major weapons, along with the staff, saber, and the sword, called in this group "The King of Weapons". Common features of the Chinese spear are the leaf shaped blade and red horse-hair tassle lashed just below. When the spear is moving quickly, the addition of the tassle aids in blurring the vision of the opponent so that it is more difficult for them to grab the spear they are being attacked with behind the point. The tassle also served another purpose, to stop the flow of blood from the blade getting to the wooden shaft (the blood would make it slippery or sticky when dried). The length varied from around 7 feet (2 meters) long, commonly used by infantry, increasing up to the length of 13 feet (4 meters) favoured by cavalry. The spear is typically made of wax wood, a strong but flexible wood. It bends to absorb impact preventing breakage. The bending motion combined with the horse hair tassle makes the spear tip very hard to follow.